The creatures of Pandora have picked up a few new tricks since last time. The inhabitants of the backwater planet of Pandora were never the brightest bunch. Not that you can expect much from bandits and feral creatures - after all, one group is a collection of mindless animals, and the other is the wildlife. Still, they've stepped up their tactics for the upcoming Borderlands sequel, so if you thought the first game's firefights were lacking in complexity, you're in for a treat. 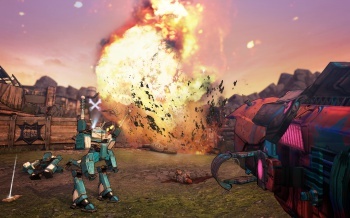 In keeping with Gearbox's promises of "more everything," Borderlands 2 will boast 15-20 different enemy types. That's a vast improvement on the original game's (somewhat limited) selection, especially when you count enemy variants that push the count to between 200 and 300. Even Jasper Foreman, lead AI programmer at Gearbox Software, wasn't sure how many variations of baddies there are in the game - he once tried counting them with a script, and because of the combination of factors that add into each enemy type, it didn't work. Skags, one of the most memorable species on Pandora, will be back with a few new moves. Badass Skags, in particular, have gained the ability to buff smaller critters with improved health, speed, and special attacks. They're joined by some new kinds of fauna, including sandworm-like Threshers. These "squid worms" (as Foreman calls them) can strike from anywhere, burrowing underground and whipping tentacles at one opponent while its head emerges elsewhere. Wormhole Threshers pull unsuspecting prey in to impale them, and Tadpole Threshers fire themselves into the air and dive bomb opponents like squishy, juicy missiles. Pandora is home to more than meatbags; Hyperion Corporation's robot army will make up a large portion of your foes. WAR Loaders and BUL Loaders (the latter of which can transform into a bulldozer) make up much of the ground forces, with support from a handful of other bots. Tiny, flying drones called Surveyors repair bigger droids when they go down. Constructors continuously build more robots to harass you, but are far from defenseless alone, armed with a small arsenal of missiles and lasers (not to mention an emergency nuke). Each enemy type has a wide range of behaviors, according to Foreman. Midget bandits may hop onto the shoulders of hulking Goliaths to double their threat - but shoot the helmet off the raging Goliath and he'll go berserk on everything nearby (bad news for the midget). Foreman says that while not every pair of enemies has tricks like this, there are many species that do. Think it's a bit too much to remember? Not to worry - the Ultimate Loot Chest Limited Edition copies of Borderlands 2 will include a "Creatures of Pandora wide-format ID chart" detailing every living thing on the planet. If you don't have $150 to drop on the Loot Chest, you can always just shoot first and sort 'em out later when the game arrives on September 18 in the US, September 21 in Europe.